I’ve worked out of two different garages both of which never had heat. Living in the northern most city over 1M people where winter sticks around for 8 months, it really puts a damper on shop time. Even in an insulated garage it will hover around 0 degrees and you just can’t work in that kind of temperature. 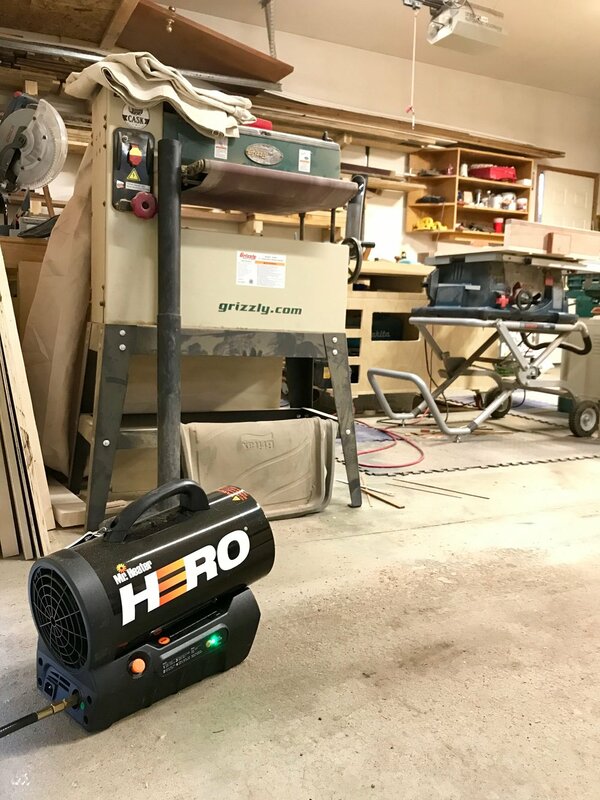 However, that has all changed this week as I was sent a Mr. Heater Hero35 cordless forced air propane heater to try out in my garage. They do say big things come in small packages and that’s very much true for this Hero heater. Essentially is the new “Hero” in my garage. The biggest highlight in my opinion is the cordless feature. My previous “heating” device was a pitiful electric heater which you could only feel the heat if you stood right in front of it. Worst of all, electricity cost a lot of money in Alberta, and this thing was easily the most inefficient cost in the house. That changes today, the Hero35 is cordless and comes with a 8 hour rechargeable battery pack that can even be used while it’s charging. Also of importance is the noise as most forced air heaters can be quite noisy. This is surprisingly quiet and works well inside a two car garage. There is also a larger unit that has 60,000 BTU per hour for a few dollars more. I have not tested that device however it can be found here. I wanted to see how quick the heater could raise the temperature in my garage within 30 minutes. I grabbed a thermometer from my backpack because really who just has thermometers just kicking around? Placed that in the garage for 15 min to get a good reading. Starting out temperature was 6 Celsius or 43 Fahrenheit. I ran the heater for 30 minutes and during that time after only 5 minutes it increased a few degrees and with how cold it feels in my garage, that surprised me. In the end we achieved a temperature of 14 Celsius or 57 Fahrenheit which was much more comfortable to work in and kept my fingers more limber. It is worth noting, after the first two burns, there is virtually no smell that I could detect. The first two burns will burn off any of the oils that protect the element from the factory, however after that there really is no smell at all, just the smell of glorious heat! While all of this is great, it is very important to make sure you read the manual and ensure you properly ventilate. For me I cracked the garage door open maybe 2-3 inches and on the other side of the garage I cracked open the man door which created a nice cross breeze. It might be a bit overkill, however I wanted to ensure I’m safe in the garage. This device can be purchased through my Amazon link. You can also check out the manufactures website for further details and specs. Disclaimer - The Mr Hero35 was given to me to review as part of their Ambassador program.